This method is simple: just copy the texts by writing them in your notebook, no matter where the texts come from, be they from websites or books. At this digital era, I guess some of you might have forgotten these kinds of old techniques. All the texts you have copied on your own are records of what you have viewed and learned. When you want to review it some day later, these records will be a good reminder. All you copied is the proof of your hard work. And it’s apparent how much you have done. This will give you a great sense of achievement. This entry was posted in 未分類 on 2014/08/26 by gontama. I’m learning Indonesian through Chinese with a textbook intended for Chinese people to learn it. 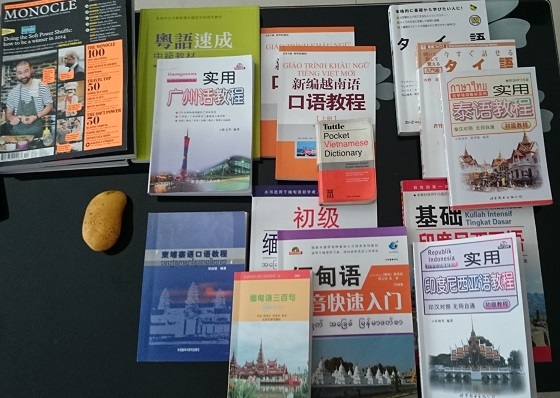 And, I learn Chinese as well through this method.I bought lots of language books during my stay in China to apply this method for other languages. Normally, when English speakers learn a language, they use materials designed for English speakers and written in English. In this method, however, I suggest they use textbooks intended for Japanese people to learn English for the sake of learning Japanese. Tim Ferris, author of the New York Times best-seller The 4-Hour Workweek: Escape 9-5, Live Anywhere, and Join the New Rich (Expanded and Updated) calls this method reversed learning in the interview with Benny Lewis, the founder of fluentin3months. With this technique, you use a self-teaching material intended for speakers of the language that you want to learn. Let’s say you speak English as your first language and Japanese as second. In this case, you can read English textbooks published in Japan. Japanese is my first language, and I’m learning English. 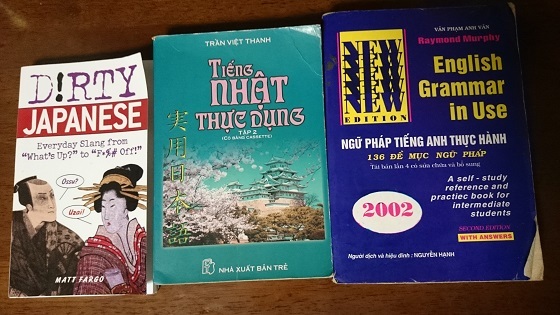 So , I can use these books (below) and the likes to learn English for example. Alternatively, you can learn your target language through learning another language. For example Benny from the interview video above said he was learning Arabic through French, and he was learning French as well through this. The preferable stage for trying this method is after finishing the basic grammar and vocabulary. What’s good about this method? John plays soccer every Saturday. It’s not from any real situation and learners see it not as real, but as a dead sentence. Because it isn’t related to us and it’s not real. The grammar explanations in the target language relate to you, because you’re interested in it and these texts are written to convey some messages to its readers. Tim and Benny say some errors and mistakes can be found in teach-yourself textbooks. As I noticed while I was reading a Japanese textbooks for Vietnamese people, sentences in textbooks are correct in terms of grammar, but sound a bit unnatural for the native speakers. I think this phenomenon is inevitable for many everyday phrases do not follow grammar when, for instance, we miss out some words to say simple, It will be tremendously tedious work to cover lots and lots of samples that are natural but not cinorrect and elaborate why. English texts in textbooks for English speakers to learn a foreign language all sound natural because they are written by native English speakers. The opposite is also true.The texts in Chinese from English textbooks in China are all correct because they are written by Chinese people. If you can read and write in Japanese, then you already know many Chinese characters used in Japanese, which are called Kanji in Japanese. Many of these kanji’s are the same in Mandarin Chinese. You do not need to learn from scratch in the way the textbooks for English speakers go about. In this case, you can use materials from Japan to learn Chinese, which are based on knowledge of the Japanese language. The way they explain Chinese grammar is not the same as that can be seen in books intended for English speakers. This is because the contents, or the way of learning of materials are based on the learners’ common sense. The approaches to the target language, therefore, change accordingly. This is another advantage of reversed language learning. You can learn two different language simultaneously through this method. It sounds pretty efficient, but that’s not the case if understanding in your second language is slower than that in your native language. It’s so much fun. You don’t need a reason before trying new things. Besides there are always new things to discover when learning this way. I found many useful Chinese phrases in an Indonesian-learning book. This entry was posted in 未分類 on 2014/08/08 by gontama.